GameStop is offering bonuses for the co-op portion of Portal 2 if the game is preordered. Portal 2 has been revealed as not just a sequel to the amazing original, but a game twice the size thanks to a full-fledged unique co-op campaign that supports two simultaneous players. While those players consist of two robots being tested by GlaDOS, people who preorder the game will also get "custom bots." The only information revealed on this promotion is from the title's GameStop listing, so it may be a GameStop exclusive (we'll have to wait and see on that). As for what "custom bots" means exactly, that's unsure. 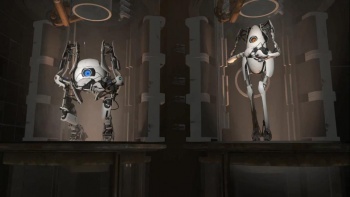 It could mean that preorders get to play as new types of robots other than the Laurel and Hardy, fat and skinny ones seen here in the extended co-op trailer getting into suitable hijinx as they make their way through GlaDOS's deathtraps. Or, players might get to customize the look of the original two robots with varying color schemes, decals, parts, etc. Preorders will also save $5 off of the game's original price, bringing it to $44.99 for the PC and $54.99 on the PS3 and Xbox 360. The same deal was offered for Left 4 Dead 2 last November, so it may become a regular thing for Valve games.